the problem appears every time when you try to create a key in a layer without any visual elements in it. The bug will be fixed in the next EDAP Tools release - version 3.0.0! I will check what happens and I'll write more tomorrow. It would be great if the ALT-F6 functionality would be able to either work with layers that have audio only, or perhaps ignore layers that a Guides" or inside of a special folder or something. 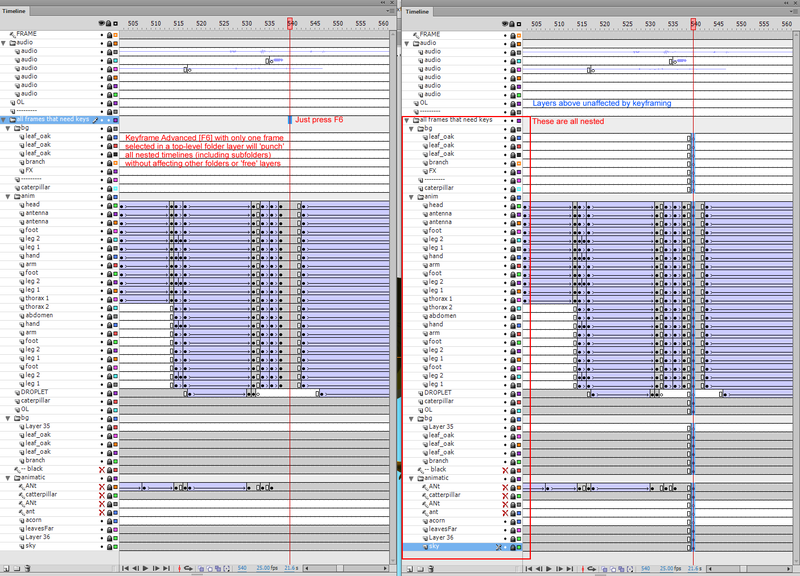 When blocking in some animation being able to key everything while scrubbing the audio is so helpful. Thanks! Hi, we'll wait for Vlad to reproduce and hunt down the bug. If you nest all your animation layers inside a folder (there can be subfolders in it too) and leave your audio at the top nested or not you can create keys for your animation layers without affecting your audio layers by pressing F6 when you only have one frame selected in your top-level folder for animation. Here is an illustration of such setup. Fantastic ! Yeah this will work great! Thanks for the info!